Top Dems Don’t Stand for Widow:It’s unfortunate that those on the Left can’t find it in their hearts to see past their hatred for Trump long enough to honor the Owens family. 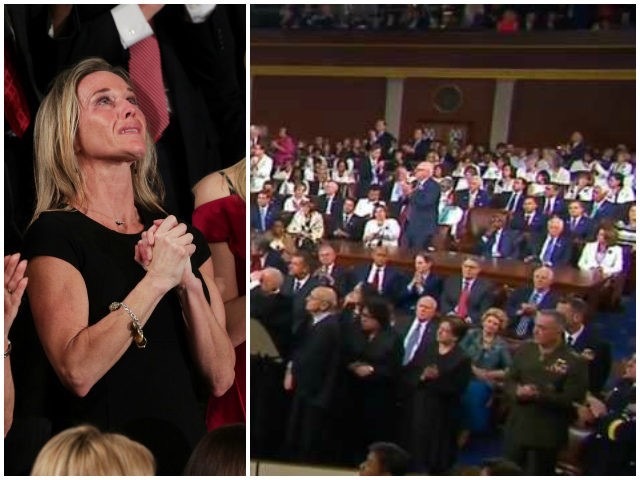 Last night at President Trump’s Joint Address, he honored fallen law enforcement officers, people slain by illegal immigrants, and in particular the President honored Carryn Owens, widow of Navy SEAL, Ryan Owens. Carryn Owens and her family earned a two minute standing ovation in memory of her husband. It’s unfortunate that those on the Left can’t find it in their hearts to see past their hatred for Trump long enough to honor the Owens family. The Left needs to get some perspective, Ryan Owens fought and died in order to keep the freedom for his country. Ryan Owens fought and died for moronic “journalists” to be able to write nasty things about him, his wife, and the President. The next time the Left feels the need to spew such hatred, they should think about the price this young, brave man had to pay, in order for them to be able to be so disrespectful. I’m looking at you Debbie Wasserman Schultz and Keith Ellison. I find it so sad that some people can’t see past their hatred for Trump long enough to honor the fallen. That’s such a slap in the face to our US military. Twitter user Dan Grilo (who has since deleted his account) Tweeted “Sorry, Owen’s wife, you’re not helping yourself or your husband’s memory standing there and clapping like an idiot. Trump just used you.” (I’m sorry, this man should be institutionalized.) How in the hell is having the whole country and the President standing on stage and honoring a man who gave his life for his country, not helping her husband’s memory?? Who are you to decide what is or isn’t helpful? What our President did was beyond incredible, not only did he specifically thank and honor Ryan Owens and his family, but for that two minutes Carryn Owens knew that the country was standing with her, think about that. Those two minutes probably meant so much to Carryn Owens, she will get to show her young kids that the President honored their hero of a father. Democrats call that “exploitation,” Republicans call that brave. Carryn Owens is the face of a strong woman. Carryn Owens deserved to have the Left stand with her in memory of her husband. Non-funny comedian Kathy Griffin criticized Trump, calling him an idiot, and that he stood on stage and said “one hateful thing after another.” Hmm, that’s odd. What was hateful? Was it the part where Trump called our military brave and honored them and all that they do for us? Or when he spoke about rebuilding inner cities and getting more people the education they deserve? Was it when he talked about wanting to protect our country from those who wish harm on us? Or was it hateful when the President made this statement: “Police and sheriffs are members of our community. They are friends and neighbors, they are mothers and fathers, sons and daughters – and they leave behind loved ones every day who worry whether or not they’ll come home safe and sound.”? Is he hateful, or do you just hate him? The behavior from top Democrats along with others on the Left last night, was utterly disgraceful and they are an embarrassment to our country. On behalf of the Owens family, I’d like to personally thank Ryan Owens for giving his life to the country that he loved.